Somerville, Mass – Our neighbors’ cherry tree has several low branches that hang over the fence and into our air space. So those are technically our cherries, right? 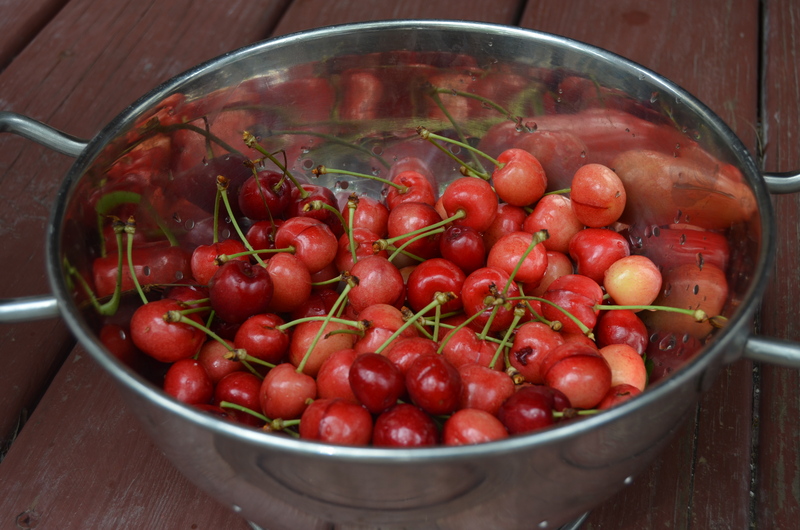 Last week, the twins enthusiastically helped the neighbors pick the cherries on their side of the fence. But this morning, when I asked for help picking the cherries on our side of the fence, they were not interested. No way was I going to lure them away from their Legos on a Saturday morning. I also got no help when I asked the twins if I should use the loot, I mean fruit, to make cherry pie or chocolate-covered cherries for dessert. One vote for each, as I should have expected. So I did a little research and found a recipe which offers the best of both worlds: chocolate cherry crisp. And yes, I finally got some participation from the twins when it came to eating it.